Shortly before the 1797 annual conference of the Wesleyan church (held at Leeds), the congregation of Hanley Wesleyan Chapel were locked out of the chapel by the trustees for supporting a resolution embodying the demands made by the group led by Alexander Kilham. These demands resulted in schism and the formation of the Methodist New Connexion. By 1797, only six years after Wesley's death, dissension and divisions were surfacing within the Methodist church. One group who broke away from the main Methodist body over questions of church government and discipline became known as the "Kilhamites" or "Methodist New Connexion." This group enjoyed some success in each of the Potteries towns, but particularly in the area around Hanley and Shelton. This may have been due to the influence of Job Ridgway, a pottery manufacturer in Hanley, whom Henry Wedgwood called, "one of the most remarkable men Staffordshire ever gave birth to." Ridgway was one of the founding fathers and leading figures at Bethesda Chapel in Albion Street, Hanley, which became the central place of worship of the New Connexion. The chapel was rebuilt in 1820 to seat 3,000 people and became known as "The Cathedral of the Potteries," a name it has kept to this day. 1797 At the 1st conference of the Methodist New Connexion. William Smith asked for a minister to be stationed at Hanley. Smith, Job Meigh and George Ridgway & John Ridgway were the foremost in forming the new church at Hanley which began to meet in William Smith's house at Shelton in 1797. Soon after the 1st meetings in William Smith's home, a coach-house in Albion Street was acquired and converted into a meeting-house. 1798 The 1st Bethesda chapel was built on the site of the coach-house, it seated 600. A regular minister was installed. The membership of the Hanley New Connexion Society was 301. 1799 The chapel was registered in autumn 1799. 1811 The trustees decided to enlarge the chapel. A semicircular extension at the rear increased the seating to 1000. All the seats were let within a few months of the reopening. 1812 By this time the Hanley circuit, of which Bethesda was the head, became the strongest in the Connexion. 1815 The membership of the Hanley New Connexion Society was over 1000. 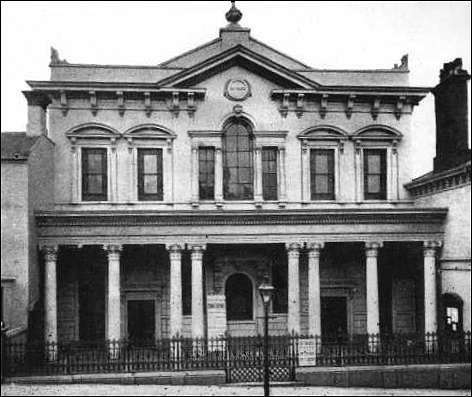 1819 The original chapel was demolished and in 1819 a new chapel was opened on the same site. 1821 The membership of the Hanley New Connexion Society was over 2000. Adams, Boyce treasurer for 25 years.